This spacious architecturally designed holiday home built on two and a half levels is situated in a hillside garden. 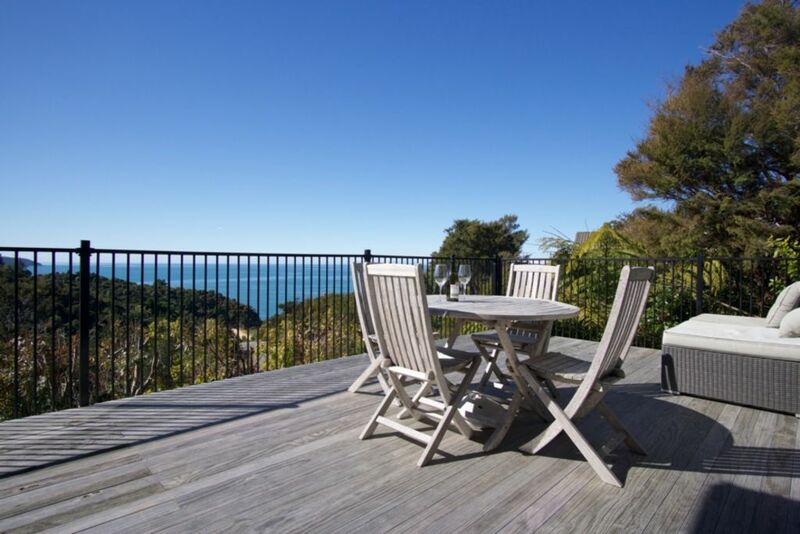 Extensive views over Tasman Bay with sliders onto the deck around three sides. A large living area with log fire and wood provided for your winter comfort. Modern appliances and furnishings including dishwasher, DVD player etc. With excellent indoor/outdoor flow the house is ideal to enjoy outdoor dining. There is plenty of space for everyone to enjoy their holiday, and the upstairs bunk room has an additional TV and DVD set up providing a great ‘extra space’ for children to enjoy board games and/or a movie after a long day at the beach! From the house it is only a 7 minute walk down to Kaiteriteri Beach or Breakers Bay. With all day sun it is a great place to base yourself and your family while you explore the Abel Tasman National Park, and the Nelson/ Tasman/ and Golden Bay regions during the winter or summer months. Come and visit the golden sands and bask in Nelson’s glorious sunshine. Please note that we only have limited Sky TV channels during the low season (no sports channels). Minimum stay 7 nights Jan-Feb. All other times 2nights. Views of Honeymoon Bay from deck. One portable electric heater as well as the log burner. Linen available for hire. Duvet covers and pillows provided. Fisher Paykel top loader - cold water washes only. Washing powder, fabric softener and stain remover provided. Log burner (wood). Free wood during your stay. Free Wi-Fi for your computer / phone. Tea towels, hand towels and bath mats provided. Bath towels and face cloths available for hire (no beach towels). Living room currently have 3 couches that seat 9 people and 2 ottomans. Coffee table, bookcase and wall mounted TV. Coffee plunger available. Need to bring your own coffee and grinder. Instant coffee and sugar available. Salt & Pepper and limited amount of other spices. Recommend you bring everything you need apart from salt & pepper. Some condiments in fridge. Flour, sugar, tea, coffee & paper towel. Plenty of plates, bowls, serving dishes, cooking utensils, knives, forks, spoons. Water, wine, beer, champagne, shot and martini glasses. Coffee/tea mugs. Full kitchen Refrigerator, electric stovetop and oven, microwave, dishwasher and sink. Open plan kitchen / dining / living. Kitchen table seats 6. Kitchen island bar seats 3. Outside tables x 2 seat 4 + 4 people. Sony HD TV, DVD player and good selection of adult/children movies, limited SKY TV during off season & full SKY (including sports channels) during peak season. Ask owner if available during your stay. Limited SKY TV during off season & full SKY (including sports channels) during peak season. Ask owner if available during your stay. Yes, two TV's and two DVD players available. One large TV/DVD in lounge and small TV and DVD player in the bunk room. Good selection on DVD's including kid-friendly ones. No lawn or flat land. Steep hillside garden. Doesn't have the required rails by toilet and in shower. And there are two sets of stairs in the house which would make it difficult in a wheelchair. Amazing bush sanctuary with a beautiful view. This was a lovely place to stay and relax. The deck and outdoor area added to its appeal. Quick walk to breakers bay for a swim. The only negatives would be that the bbq gas bottle was empty- as was the back-up one in the garage so had to purchase our own. Bunk bed matresses were a bit hard so older people may suffer during a long stay. Other than that, wonderful place. would definitely stay again. Thank you for your feedback. I am so pleased you all had a wonderful time and enjoyed the house and it's views. Once again, apologies for the empty gas bottle. I trust the reimbursement for re-filling the bottle reached you ok? Absolutely loved the location of this property. It was well equipped and comfortable but the main attraction was definitely the views. Property itself was a bit tired, not quite what we had expected. We loved our stay at this house. It has everything we needed and a stunning view! Fantastic property with amazing views. Fantastic property with amazing views. We had such a lovely holiday with our family - the house was clean, warm and had everything we needed. The Sky and Wifi were a great bonus. Good views and 12 min walk to Kaiteri. Good views and 12 min walk to Kaiteri. House has everything you need. Was a pleasure to stay at ,beautiful views and very well appointed.